No... It's still the same exact amount as not having the dividend at all. How do people still not get that number of shares literally doesn't mean anything? It's the total dollar amount that matters. So, then, is the much-touted "miracle of compounding" nothing more than propaganda? Without dividend reinvestment, there is no compounding, thus no miracle. I'm not arguing that dividends are the greatest thing since sliced bread, but is it your position that they are completely worthless? IMO dividends are a leftover from when people would buy a paper share in a company. It was harder and more expensive to sell shares back then. And you bought or sold a share - not a partial share. So if somebody wanted to own part of a company, and get their share of the companies income, the company would pay dividends on the shares. Now days it does not matter much, for most investors. Investments compound with or without dividends. Again, it's the exact same thing. Compounding simply means that your investments grow by a certain amount (say 6%) in an arbitrary period of time (say a year), then the new total grows another 6% the next year. It has nothing to do with dividends. Notice how dividends are not mentioned on that page at all. a resulting multiple of that increase. soboggled wrote: You are quoting out of context/misinterpreting. You are either trolling or engineering schools don't teach logic anymore. Every time I get a dividend, the effect on my net worth is 0. Drawing on my knowledge of arithmetic, I conclude that the sum effect of all dividends over time is 0. I really, truly don't get it. What do you propose company X do with the profits? I feel like you are ignoring this problem. Company X makes money and you are a partial owner. If you don't want/need the profit and you believe in company X, then buy more. Of course Company X is worth more while sitting on a load of cash and of course it is worth less once it has distributed this cash to the owners. This is the difference between reinvesting and not reinvesting the dividend, but that isn't the issue. Apparently I was on of those people that had no clue about dividends before reading this. I still think I may not understand. Let me ask a basic scenario. Say I own $10/10 shares of whatever stock. It pays a dividend of $1. The stock reduces to $9 but I still have 10 shares. I immediately reinvest that $1 dividend. So now I have $10/10.9 shares. So my total dollar amount doesn't change, but my number of shares increase and I have "more" of the company and more potential for growth. That is always ignored in these endless discussions. Once a company has no better use for the money it generates, it blows it on wasteful projects and irresponsible acquisitions, buys back shares of stock (with a litany of issues that have been discussed ad nauseum), or it pays it to the owners (or a combination). Nothing forces someone to invest in a company that pays a dividend. I doubt anyone could force Warren Buffett to invest in a company that pays dividends, and he does so with great regularity. Is the effect on Buffett's net worth "0" or does Buffett believe he can better utilize excess cash than the companies he favors, in the long run? Is he right? As a thought experiment, ask yourself if you'd rather have a dividend or let the company throw an annual week-long bacchanalian festival with free-flowing alcohol, unlimited food, and expensive hotel suites for all employees, until all excess cash was spent "team-building". It's an extreme example, but it is offered to the "no dividends, ever" crowd. "Over the last 40 years, 71% of the stock market's return came from dividends, not capital appreciation," O'Leary says, reciting the statistics like a form of gospel. Of course, all the negative information about dividends is priced into the value of shares, if stocks are priced efficiently. They should be discounted accordingly. and more potential for growth. No to maybe. You are assuming the company has good prospects. There are a fair number of "zombie" companies out there. Their earnings are either stagenet or falling. So the company is slowly liquidating its bussines by paying out dividends. Another way to look at this is this: Who can better invest the spare cash on the balance sheet? Managment or you? If you are some fast growing tech company or Warren Buffet the answer is easy - managment. If a company is in a death spiral - then you. Most of the time the company's splits the difference and does a bit of both. Technically with the dividend you now have less money due to taxes. So now you have $9.75 instead of the original $10. It's hilarious that dividends do the exact opposite of what most investors think it does. At best it does nothing, at worse (the most common result) it creates tax drag that reduces your returns. But ignoring taxes for a second, yes you have more shares.... but for normal investors that has absolutely no significance at all. The number of shares you own doesn't make a difference for growth or anything else. You own a higher percentage of a company worth less than it was before - unless this marginal increase in ownership gives you majority control it is functionally the same. Let's illustrate it with simple numbers. Case 1: I own 10 shares in a company worth $11/share that gives $1/share dividend which I reinvest. I now own 11 shares in a company worth $10/share. The company value grows over the next quarter 10% back to the $11/share, I have $121 in value. They distribute their $1/share dividend and I now get $11 in dividends and am left with 11 shares worth $10/share - for a total value of $121. Case 2: I own 10 shares in a company worth $11/share that doesn't distribute a dividend. The company value grows over the next quarter 10% to now be worth $12.10. I own 10 shares in that company, or $121 of value. See, reinvesting dividends is functionally the same as if they didn't distribute dividends at all. How does that change though if the dividends are paid out of a mutual fund? The dividend would be reinvested in many companies, not just the one that paid the dividend. Wouldn't the tax issue be negated if it was, use my case, held in a 401k? I fail to see how owning more shares doesn't equate to more potential for growth/loss. If I have 1share at $1. 2shares = $2. I'm asking from a place of confusion again. I guess I don't understand at all. Yes, in a 401k you don't get taxed. That's the "at best it does nothing" case. Just get your mind off of shares. Number of shares is something you don't ever have to concern yourself with. 2 shares of $100 is the same as 20 shares of $10. As an investor, there's no difference between those two states. Let's say the stock goes up 6%. As you can see, you're not better off one way or the other (in a 401k. In taxable you'd be worse off as I mentioned earlier). First of all, there is a fallacy that dividends don't matter just because the periodically step the share price. Maybe it would help to think about a company with absolutely no growth, say a fictional electric utility that serves a fixed geographic area by running a handful of power plants. The company needs to do a bunch of things, build power plants with bond financing, buy fossil fuel to burn, hire guys in trucks to keep everything running smoothly at the plant and at all the customer endpoints. They also need to hire managers and accountants who are able to manage the plant such that it returns 20% profit every year on operations. This company is so boring and regulated that it really doesn't have anything it can do with the profit except give it to the owners. Let's also say it was capitalized by common stock and that profit amount happens to be 10% of the total outstanding market cap of the company's stock. So now everyone with $100 of stock can expect $10/year of income, paid out quarterly. Every quarter the stock price drops $2.50 and slowly rises back up again back to $!00, with a ramping, ratchet-like behavior. So even though the stock price has a quarterly step-down, it's basically stable at $100, and yet is returning 10% a year. Such a stock would be a good investment, even though the 10% is subject to tax and even though the price does it's annoying but harmless quarterly fluctuation. A mutual fund that owned this stock could reinvest the dividends in other stocks, but I think the tax laws require them to report the dividends anyway so they might as well cash you out and let you decide whether to reinvest the dividends. Obviously some tech companies that are trying to grow as fast as possible to conquer their market have better things to do with profits than paying dividends, but plenty of other businesses are some where in between and throw off cash profits back to the shareholders, and mutual funds own plenty of those types of companies. Does that help explain why dividends can be okay and why the temporary pricing changes don't really matter in the long run? Unless the company that doesn't pay dividends wastes the excess cash. In that case, you'd have been much better off receiving some of your money back. People who invested in Pets.com or Enron got nothing back, if they held on until bankruptcy. They're much worse off, left holding an empty bag. There's a reason "growth" companies generally pay no dividends, while "value" companies do. Growing companies believe they can reinvest excess cash to continue growing, expanding, improving, advancing. Stable companies believe they have exhausted opportunities to expand, to a large extent, or generate so much cash they cannot deploy it effectively, so they reward owners with a direct return of some of the money their companies earned. There are plenty of reasons to invest in growth companies. There are plenty of reasons to invest in value companies. There are plenty of reasons to invest in a broad market index and just letting the market decide for you. So, lets go back to the start. A foundational bit of investment theory is the Miller Modigliani Dividend Policy Irrelevance Theorem. It makes about a half-dozens assumptions. For example, it assumes no taxes and that the company and investor have equally good reinvestment opportunities. While these assumptions are not true, we can measure the difference between reality and theory, thus figuring out the impact of inefficiencies. Back to your question. Back to your original question. It would depend on the underlying companies. If done against a broad and efficient market, like the S&P 500, you statement is very true. If done against a less efficient market, less true. I think I fell asleep right there! But thank you, I feel like I have at least a minimial grasp. I am happy to be out of the mindset of "I just made a bunch of profit on dividends!" Most of this really doesn't matter to me beyond my own curiosity. Of course dividends can be, and usually are, okay as you said. The pricing changes from paying dividends, if the money is reinvested, don't change an investor's long-term return. The problem is some posters, and many lurkers and other investors, believe dividends increase one's wealth. They don't. They come directly out of share price. Barring income taxes, one's financial position after receiving a dividend from a corporation, or an equity fund, is the same as it was before. Daily fluctuations in share values may make the effect hard to see. Yes, of course dividends are okay. They're just not, as frequently claimed, better than other sources of total return. In order to qualify, the investment company must register under the Investment Company Act of 1940 and must distribute all, or substantially all (90% or more) of net investment income to the shareholders. Also, 90% of the fund's income must derive from income from dividends, interest and capital gains from the portfolio's securities. Finally, at least 50% of the fund must be invested in diversified securities. If it helps, imagine you are a money manager responsible to purchase real estate for your clients. You buy a rental property, which your clients own. The renters give you rent checks every month. After you've fixed the roof, renovated all the bathrooms, updated the wiring, replaced all the windows and doors, upgraded the air conditioning and heating systems, and installed high-speed wireless internet, you will eventually have rent money you cannot wisely "invest" in upgrading the property. Eventually, you will pass along those rent checks to the owners. That is, in essence, the situation in which some companies find themselves. As a shareholder, you are an owner, and are entitled to receive profits. You, as an owner, actually elect the board of directors, and the board decides whether to declare dividends. Shareholders collectively choose to receive dividends. It certainly doesn't pay to have the irrational hatred for dividends so often on display by some posters. Dividends serve a purpose, and are one means to begin to obtain that cash return on your investment everyone claims to seek. Wouldn't dividends help long time controlling families of public companies? People like the Waltons with Wal-Mart do not have to sell their shares to fund their lifestyles. Instead they can rely on steady dividends to pay the bills and continue to maintain the same ownership of the company. I know people who live off of shares in private family controlled businesses like this and always thought it could be true for some big companies as well. Well the subtext I got from the OP's various posts was not "gee, why do dividends exist?" but rather "As a growth investor, why would I ever choose a stock that pays dividends. Is there something I'm missing?" Also note that the post is 2 years old, but obviously still fun to debate. It seems to me that there is an inappropriate concentration of attention on the moment of distribution versus the long-term impact. Yes, admittedly and without contention, the net dollar-value effect of a distribution of dividends at the time of distribution is essentially zero. However, if one can get past that and look down the road, then one should realize that more shares of a particular security will long-term result in more dividends, more total dollar value, and more return overall than fewer shares would. So if one can accumulate more shares of a security with (admittedly) no additional dollar cost, then why is dividend reinvestment a bad thing? avalpert wrote: More shares at a lower price - same value. So yes, not 'exactly the same' just functionally exactly the same. You have bought someone else's shares with the dividend (rather than pocketing it or using it for some other purpose). You now own a higher percentage of the company and accordingly more of its future earnings. If the dividend payout per share remains the same, you will get more money next quarter. The person who sold you the shares will get none. How is that functionally equivalent? No, you would have the same amount of money had the dividend not been issued. You have more shares but it's worth less per share. It's literally the same thing. I'm baffled. Perhaps we aren't communicating. I agree it is exactly the same amount of money either way. The company is distributing money to its shareholders, and the new values of your shares + the cash you get is the same as the old value. However you own more of the company if you reinvest dividends than if you don't. And accordingly a larger share of its future earnings. How can that not be the case? If the number of outstanding shares stays the same, the outcomes of reinvesting dividends vs doing something else with the dividends are of course different. Basically the dividend is a forced choice to reinvest (buying a higher share of the company than you previously owned) or not (accept a lower share of the company and purchasing something else). Please cite, with a link, one example from this forum of irrational hatred for dividends. The argument isn't that dividends are bad. It's only that they're not superior to other sources of total return. Other sources are equally good. The irony of fate means probably you will cite something I wrote. Simply put, owning more of a company because you reinvested a dividend doesn't make a difference, compared to owning less shares if the company had not issued a dividend in the first place. The total return you have in both amount of shares owned is exactly the same. Yes the return is the exactly same. But no the end state is not the same. I'll do an example of my own, tell me where you think it is wrong. 1) Company XYZ has two owners, A and B. Option 2: distribution of $1 to each A and B. A chooses to reinvest, B sells at market rate. Stock price falls to $0.99/share. The two end states are not identical. Person A owns more of the company than person B. Person B has some extra cash. And note, I'm not a dividend fan, particularly in my taxable account. Don't think dividends are magical in any way. Just making the point that once there is a dividend the decision to reinvest or not reinvest results in different ownership stakes in the company. Last edited by Da5id on Sat Oct 20, 2018 6:44 pm, edited 1 time in total. I suggest you do a search for dividend investing on this forum. I could mention the names of one or more specific posters but I do not want to cause a fight by calling someone out over their irrationality. If you feel that something you wrote might fall into this category, that's on you. I also suggest the OP not fear dividends, not avoid dividends, and simply accept them as a natural part of the evolutionary lifespan of a successful corporation. By "end state," we meant that the total return is the same. Which you agree. The end monetary values in Option 1, Option 2A, and Option 2B are all the same: $100. Person A in Option 1 or Option 2 is not better off in either situation. Owning more shares doesn't mean anything...he or she still has $100 either way. Ok, I think I understand what you're missing. This thread is not discussing the difference between persons A and B, but rather the difference of person A in situations 1 and 2. Obviously a person who reinvests their dividend will own more in a company than the equivalent person who doesn't. I fail to see how owning more shares doesn't equate to more potential for growth/loss. Perhaps because you are thinking about future gains in dollars per share rather than in percentages. The example quoted in the post you replied to shows this well: extra shares after receiving and reinvesting a dividend don't give you extra growth when the price rises X% compared to no dividend, because the price is rising from a lower starting point so the $$ per share of growth is smaller. Even without specific numbers, once you accept that the value of your holding is the same before or immediately after the dividend+reinvestment, then you should also understand that when the value increases by X%, both scenarios end up at the same value after that growth. 2) company distributes earnings, some of those receiving dividends reinvest them, resulting in them owning a higher percentage of the enterprise (others obviously need to sell shares to those who choose to reinvest, new shares aren't being issued). Those scenarios are not equivalent even though of course on the day of the dividend you have exactly the same amount of money (less any taxes you will owe on the dividend if equity is held in taxable). In scenario 1, the retained earnings may cause the company to grow faster. Or if the money can't be used in an efficient way, your return may be lower than in scenario 2. Note not arguing in favor of dividends. For companies that want to distribute earnings to owners, in taxable I prefer buybacks, in tax deferred/free I don't care about the distinction. I was only responding to the poster's belief that owning more shares of lesser value exposes you to more growth potential as a shareholder. I have no thoughts on the separate issue of how a business decision to issue dividends affects the business itself or its growth. Nobody has brought up that dividends can reduce the risk of owning a particular stock. If shares are owned within a fund, those reinvested dividends get spread across all other stocks in the fund, proportionally, including those of companies that pay no dividends. If owned individually, the owner can choose to invest the money elsewhere, such as in underperforming stocks, bonds, commodities, or real estate, or hold the cash to reduce overall portfolio volatility. Not logical, IMHO. If you don't reinvest the dividend, you are decreasing your holding of a given stock (as in you own a lower percentage of the company after the dividend than before). If you want to own less of a stock that doesn't pay a dividend, you can of course sell some fraction of it to achieve the same end. If you say dividends make that easier, you are arguing that the precise amount of the company that you should sell to "reduce your risk" is by an amazing coincidence the amount they choose to send you as a dividend check. Perhaps I didn't explain it clearly enough, as you are not understanding what I wrote. A company, by paying dividends, forces you to lower your risk if you hold it in a mutual fund or ETF. It spreads your money around for you. If held as an individual stock, you reduce the value of your holding by the amount of the dividend unless you choose to reinvest it. No coincidences required for this to work. It just does. A company, by paying dividends, forces you to lower your risk if you hold it in a mutual fund or ETF. The company is not "forcing" anything. If you want to spread you money around, you invest the dividends in some other company. If you want to keep your ownership the same as it was, you reinvest the dividends in the company that paid them. The only way the dividend makes anything "easier" is if - by coincidence - management happens to decide on a dividend policy that you prefer. Last edited by vineviz on Mon Oct 22, 2018 6:22 am, edited 1 time in total. Interesting. I just had a conversation at work on this very same subject. Anyone care to comment on the best Vanguard Dividend Mutual Fund? The company is "forcing" anything. Unless you are somehow in control over what investments your ETF or mutual fund makes, then it forces you to lower your ownership of that particular dividend paying stock. It indeed does force it upon you, whether you view it as positive or negative. You can't make up facts to support your position, and the facts are pretty simple here. Young, actively growing companies can't be certain of their financial picture next year, so they don't pay dividends. Instead, their share price goes up if they do well. By analogy, if this were your own small business, you'd be wanting to leave the cash in the business at first. Older, more financially mature companies pay dividends. One of the oversimplified points of view I think a lot of not so savvy investors have is: I'll just hold the stock forever and collect the dividends so I'll be doing well no matter what the stock price does. I always thought that the whole idea was to focus on total return. But it is also nice to have a guaranteed stream of cash that equals your expenses. When you are receiving a nice salary, that is hopefully covered. But after retirement, not necessarily so. Expenses minus [earned income + interest + annuity + Social Security + pension] can be made up by Dividends. Theoretically, Dividends mean the company you own has already made money and is profitable and that is why they are cashing out some of their value. It is like owning a company, and you are the sole owner, and you take some of your company's profits home. At the end of the day, you own the company and you own your home! You just moved the wealth from inside the company to your home (and paid taxes on that transaction). However, it is a good sign that your company generated money during that period. Else, you wouldn't be able to take money home. So deciding to get money out of the company to your home doesn't do any good by itself at this point. The "goodness" happened right before that point when the company generated profits and its value in the market increased. Also, as an alternative, you might choose to leave the excess money in the company and buy some more machines and expand. Again, your net worth is the same at this point and it doesn't really matter. Or you might choose to take money out of the company, and buy another small tiny company. Again, all are equal at this point (theoretically), but all refers to a profitable company that made you extra money during the fiscal year. Huh. What you are saying implicitly is that dividend paying companies are bad. Because it is good that their dividends are used to move money to non-dividend paying stocks (or towards lower dividend paying stocks) in your ETF. I don't think that is what you are actually trying to argue, but that is the result. And that result only applies if you don't have a cap weighted index fund -- in such a fund the relative proportions of stocks are controlled by some type of rebalancing based on the companies market caps. So pushing around dividends doesn't change proportions of stocks regardless. I don't understand your point honestly. Nope. I don't believe they are good or bad. Dividends are simply a fact of life. They have a place, and can help some investors maintain an equity allocation in the face of market turmoil, but that is an issue of investor psychology. All I am saying is that simple mathematics means that companies that pay out some of their value in the form of dividends that are then spread across the entire equity allocation are reducing the risk of owning that specific stock, at least until the index is reset. After that, the value of the individual company within the index will be reduced, not dollar-for-dollar but likely close. Dividend payers slowly whittle away their market capitalization, but that's neither good nor bad; it is one way shareholders are paid for the earnings they own in the company. True, except that a dollar in somebody else's hands is possibly worth less to a person than a dollar in her own hands. If Warren Buffett would rather obtain a dividend and invest it as he chooses, given his track record, that makes perfect sense. If Coke can't profitably use all its excess cash without wasting it or making unprofitable acquisitions, then its board declares a dividend (which Buffett happily accepts and invests elsewhere). A dollar "over there" is worth less than a dollar "over here" since "over there" the dollar is at more risk of loss. Though many would say a buyback is a better choice for those who don't want to receive income from an equity/mutual fund in a taxable account. And buybacks seem to be favored these days, e.g. What is M&A in this graph? The article is a bit off, in my opinion. There is "Free Cashflow to Equity". 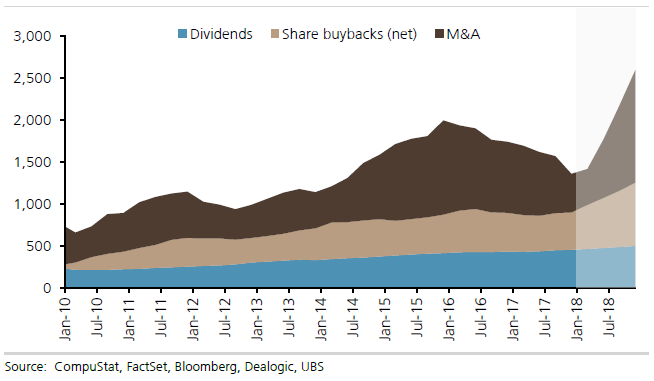 Dividends and Buybacks. FYI, in the context of this thread they are more or less equitable. There are differences in tax treatment and agency issues, but they are secondary. M&A lies on a different dimension - that of reinvestment. A company could use its cash to buy a new factory or to buy a existing factory via M&A. From a investors perspective, they are basically the same activity. I was mostly interested in a recent graph that showed proportions of buybacks vs dividends, don't have opinion on other aspect. Dividends are simply automatic withdrawals of total return. I don't think anyone would want them in the accumulation phase. I don't think most would want them in retirement either because you have no control on when to take them, for instance when the market is down. The real benefit of dividends goes back many years before there were mutual funds. Many stocks paid a divy of 4-5%, ideal for those in retirement. Taking the dividend was cheaper than buying/selling some stock for income. Without divys back then, it would have been hard to sell stocks to the general public because they bought stocks not so much for growth, but for income. They do seem to be favored now. However, we should all remember that boards of directors are the ones choosing what to do with excess cash, and they are elected by shareholders.